Well autumn has finally become winter and a seemingly never ending barrage of rain, hail and snow is sweeping in from the North Atlantic; perhaps the worst thing though is that here at 54 degrees north it is dark at 4pm and we’ve barely seen the sun in days… Time then to recount a walk I did in the Lake District only a couple of weeks ago when the sun shone from a clear blue sky and at least gave the impression that summer wasn’t long gone. 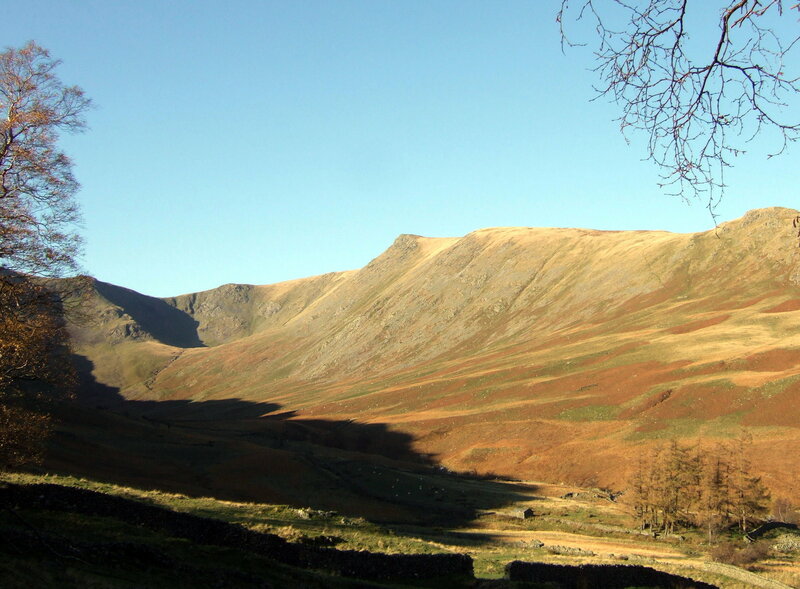 This was a walk of about 15km or 8.5 miles from Mardale at the end of Haweswater on eastern edge of the Lake District and from the road end I took the right hand path that followed the wall to cross the beck by a small footbridge. This path follows the lonely western shore of Haweswater towards Bampton but I was only going as far as the side valley of Riggindale. It’s a beautiful and isolated spot and the home to golden eagles though I am informed that just one bird returned to the nest this season. Kidsty Pike, the first summit rises prominently ahead from here and the route leaves the main path after Riggindale beck is crossed to climb pretty much straight up the grassy slopes on the left. After a while when the ridge is reached the way becomes more interesting climbing up between rocky knolls and small gullies – preferable to the grass slope which seems endless on a warm day. Higher up the views to the east began to expand and I walked on a well constructed track which had been improved since I was last here. Kidsty Pike is prominent all the way now and the top is soon reached up a much easier slope. 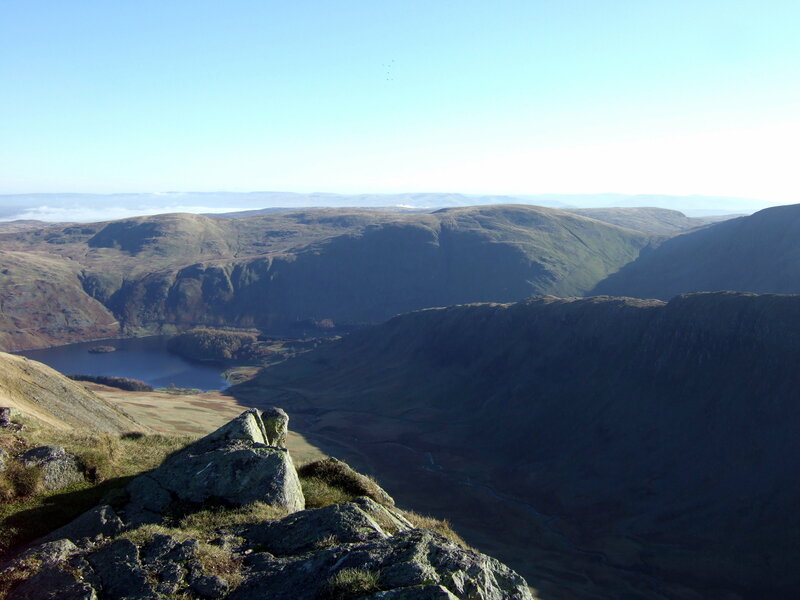 The summit at 780m or 2560ft is a fine belvedere overlooking Haweswater and the lands to the East of Lakeland that extend away to the dark line of the Pennines on the horizon. From Kidsty Pike my route followed the wide path a short distance westwards and then to the South towards High Street the highest of the so called Far Eastern Fells. 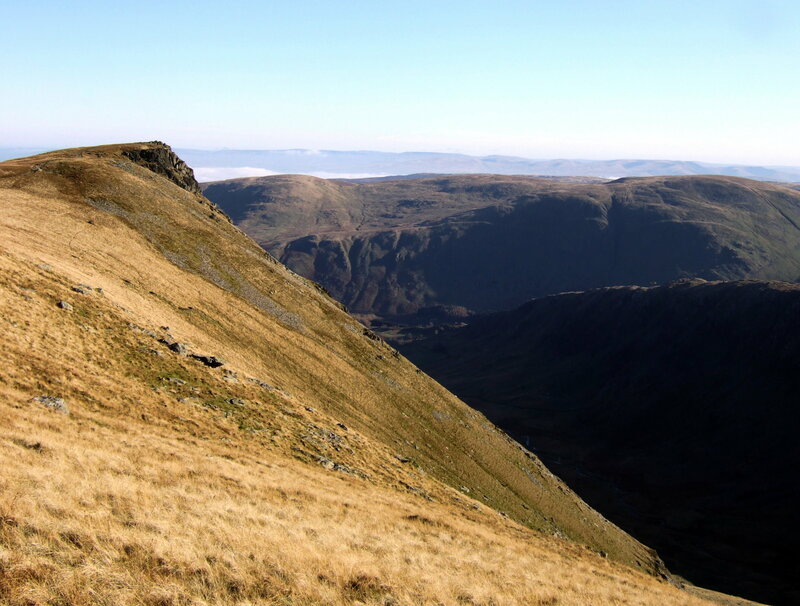 This path follows the course of the old Roman Road from which the fell is named. High Street though was not my destination today though it is easy to reach from here – simply follow the wide path until it stops going uphill – nearly a mile from here to the trig point. Instead I turned right on another path at a fork and headed back northwards and downhill; now on the western side of the range. This juncion is at the col known as the Straits of Riggindale and care must be exercised in poor visibility as it is easy to end up walking in completely the wrong direction when the landmarks are not visible so while you would stay on a good path you could be faced with a much longer walk home than expexcted! 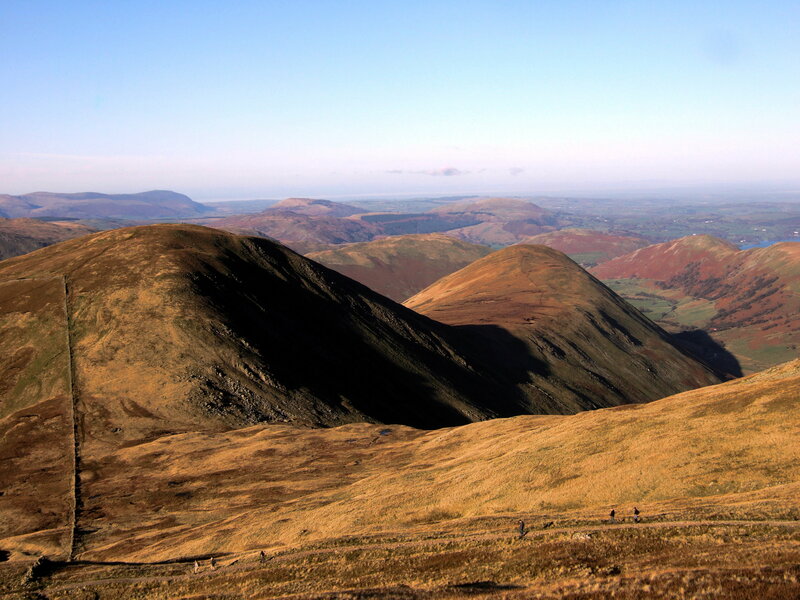 Today though the autumn sun shone from a sky of pale blue and the surrounding hills appeared in stark clarity. Strangely though despite the warmth of the day, the ground was partly frozen out of the sun and the shaded areas sparkled with frost. I followed the path northwards and slightly downhill for a short distance before making a detour to the interesting summit of the Knott (739m/2425ft) just off to the left. 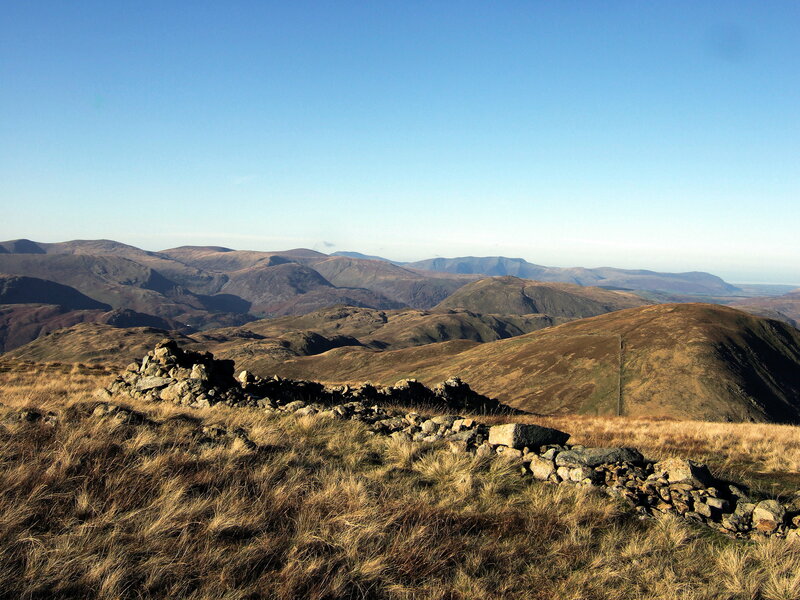 This made a fine viewpoint and an ideal place to have lunch with the Easten Fells of Lakeland as a fine backdrop. Onwards then and the next summit of Rest Dodd (696m/2284ft) lay down the far side of the Knott and across the main path where people could be seen heading down towards Patterdale. The fell rose ahead about a mile away and slightly below my present level and it was just a case of following the stone wall to reach it. 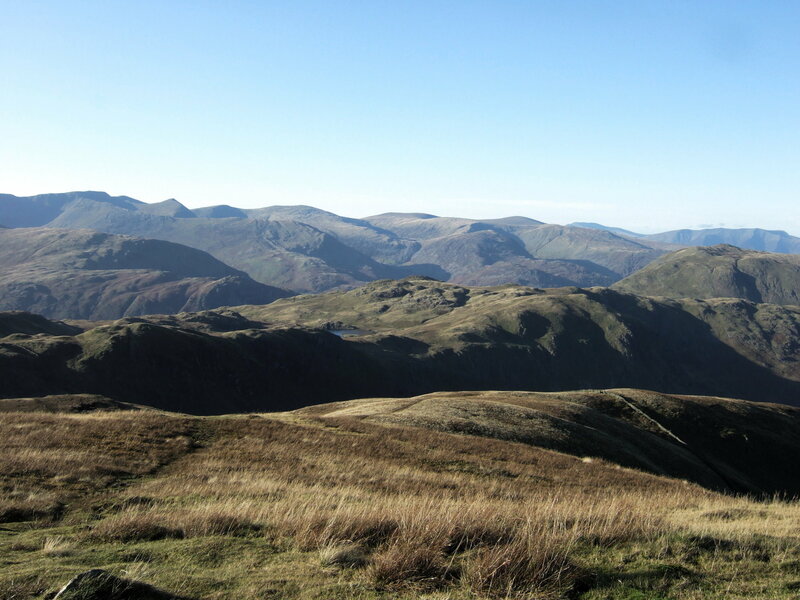 The terrain beyond the main path though proved slightly tougher and it was a long mile – a steep descent of a half frozen bog followed by a warm climb to the rounded summit of Rest Dodd where I stood today for the first time. A look at the time told me that this was as far as I was going today. The next hill on the ridge – The Nab – would wait for another day. The unseasonable weather (in the Lake District if it’s not raining you could call it unseasonable) belied the fact that it was November and it would be dark soon. I still had to re cross the High Street ridge and descend to Mardale 2000 feet down its far side. Rest Dodd in the meantime was a good place for a rest before beginning my return trip and this I duly did. The ridge on from here looks tempting – along to Angletarn Pikes and on down to Patterdale would be a nice walk but I’d be spending the night there if I did it today! 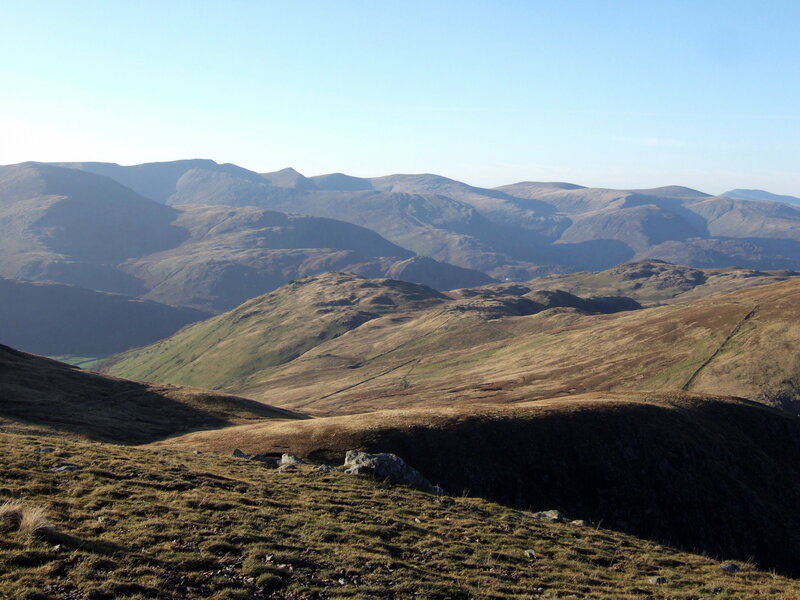 I’d noticed a variation in my return route though – a faint path leads from the grassy depression I had crossed on the way here much further to the left and up the ridge directly to Rampsgill Head on the main ridge. Opting for this, it turned out a better walk than following the wall being drier for one and with some beautiful views back towards the Helvellyn area. Skirting the edge of the crags which fell to my left I gained the top of Rampsgill Head – the highest point of my route at 792m or 2598ft – to cross the path between High Street and High Raise and make a beeline for Kidsty Pike ahead from where I had effectively completed a short circular route. The way now lay back to the valley of Rannerdale and along the shore of Haweswater where I arrived in a chilly evening that reminded me that perhaps it was November after all having retraced my steps made in the warm morning sun. This entry was posted in Lake District and tagged hiking, holidays, lake district, mountains, nature, outdoors, photography, travel, writing. Bookmark the permalink. Thanks about the photos and yeah – the Alps are awesome; going back there next summer. I’m often in the eastern alps, actually I live there. Like them! Cool – would that be Austria, the Eastern Alps? One place I’ve not been yet. I’m usually in the Bernese Oberland or Valais when I’m in Switzerland – or the French Alps. The Otztal area is on my list though. Pete… I feel ya about the light. I get to shoot only real early before work or on weekends. The more you post from where you are the more I want to put it on my to do list for pics. Thanks. Hi Mike – thanks for the comment. The Lake District is prob the most scenic part of England and I was lucky with the light too on that day. This time of year the Sun’s pretty low up here though in the Lakes you don’t always see it! Thanks Kat – it is nice to be appreciated! Hi Holly, nice to hear from you and thanks for the thought and nomination… I enjoyed your post on Switzerland by the way – looked like a great trip. Talk soon! 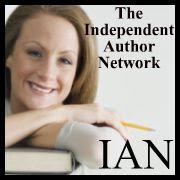 Just found your blog and enjoyed this read and your images. Excellent write up. You were blessed with a great day for this walk – a bit rare this past year with the worst of the rain hitting the west coast. I’ll be back for further look – especially at the Alpine pages. I’m off to Zermatt in 2 weeks for the umpteenth time! Hi and thanks for the comment. I know Zermatt quite well but havn’t been in winter yet – enjoy!